?Automn Flowers? David du Chemin A Rouen, circa 1640. Fine gilt brass pre-balance spring, single-hand pendant watch. C. Two-body, bassine with curved-in edge, formed of eight lobes engraved with repeated pattern, round pendant, loose ring. D. Gilt brass, champlevé radial Roman numerals, half-hour markers, central filled with engraved floral decoration. Blued steel arrowhead hand. 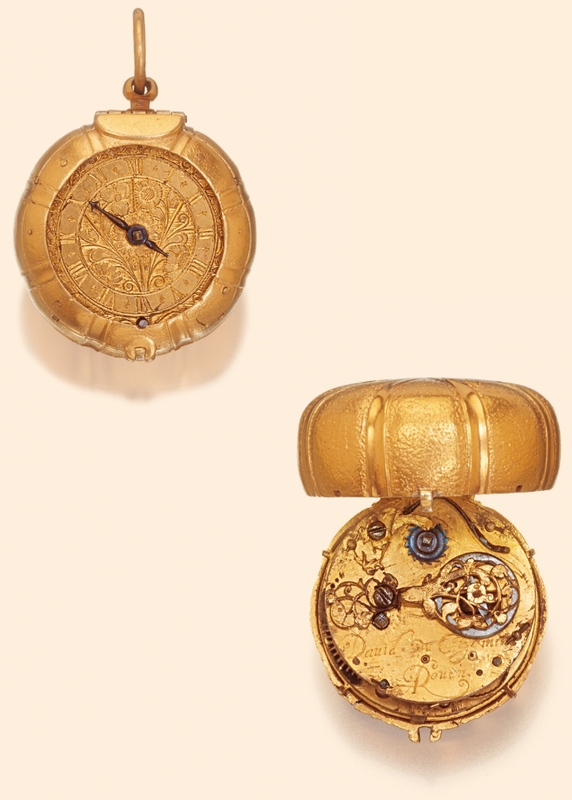 David du Chemin was part of a family of watchmakers including Jacques, David, and the son of David. They moved from Rouen to Amsterdam, and then back to Rouen, in the mid 17th century. This lot was previously sold by Antiquorum, Geneva, on April 24, 2004, lot 513.